We welcomed Essie home from her two year sojourn in Mozambique with a classic rendition of the everybody-contributes dinner party we’ve made a standing tradition in her absence. In this case, we had a little bit more of the socialist mentality than usual. Those of us not coming straight from work brought dishes that were a bit more involved or abundant than those who had had long days. So I spent a couple hours putting together this slightly time-consuming gratin, and Phoebe roasted a garden patch of vegetables to make this Autumn Vegetable Pasta Salad. But it was Jennie who really must have been cooking all afternoon on her day off from the restaurant where she’s a chef–she brought over at least 3 pounds of pasta coated with a slightly creamy tomato sauce and fresh ricotta or sausage for garnish AND an entire pan of Eggplant Parmesan. This gratin needed to be reheated at Phoebe’s, which doesn’t qualify it as the most ideal contribution to a potluck. But it’s a great side to a dinner party that it doesn’t have to travel to, and I can imagine it as a rich main dish with an interesting salad, or next to some kind of roasted pork or chicken. Either way, it speaks to the season, and it’s now infused not just with the flavors of cream, garlic, and cheese, but also of the sweet taste of dear Essie’s return. I’ll often make a gratin with a bechamel. Using cream in this case makes the gratin richer but the flavor simultaneously clearer. When you’re ready to make the gratin, preheat the oven to 375°F. Meanwhile, peel the sweet potato and peel and clean out the squash. 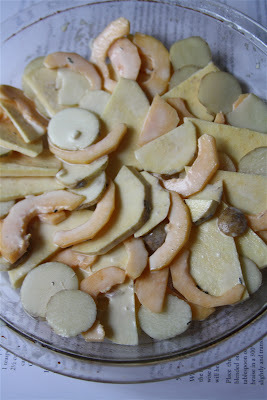 Cut all the vegetables into very thin slices–you’ll want to halve the sweet potato and the squash lengthwise, but unless the fingerlings are very wide, you can leave them round when you slice. Toss all the vegetables into the infused ream, using your hands to distribute evenly. In a 9-inch round pie pan, start to layer them in the pan, moving from the outside in, overlapping each slice with the one before it. This won’t happen very evenly, since you’re working with all different shapes and sizes, but once you’ve got the slices in there, it’ll start to look pretty. Once you’ve completed a layer, sprinkle it with half the cheese. Repeat the overlapping layering of vegetables, then sprinkle with the remaining cheese. Cover tightly with foil and bake for 30 minutes, until the potatoes are tender. Uncover and bake another 25 minutes until the top looks very brown. Serve hot. This looks very delicious! Thanks for sharing. It does look delicious! I was wondering if any root vegetables could be substituted, or will timing become an issue with too many different veggies? Kate – I think any relatively starchy root veggie would work. Because I used a cream and not a flour-thickened bechamel, the starch from the veggies needs to do the job of bulking the gratin up. Definitely! Throw them in there! Throw em in there for sure!